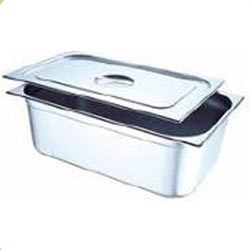 Leading Manufacturer of gastronome-pan-1-1-with-lid from Bengaluru. Our company has mastered the art in offering Gastronome-Pan-1-1-with-Lid to the clients. Gastronome-Pan-1-1-with-Lid is manufactured with the help of cutting-edge technology as per the instruction laid down by dexterous professionals. Offered range finds wide applications in various industries. This product is offered in various specifications as per customer requirements. Offered range is thoroughly checked on defined parameters to ensure complete flawlessness. Looking for G N Pans ?